For other locations, please click on this link or the flyer below. June Dairy Month: Answers to common questions about dairy farming! June is National Dairy Month! Today’s dairy industry is quite a bit different than the dairy industry of the past. To quote the email tagline of Dr. Robert James of the Virginia Tech Department of Dairy Science, “To produce one gallon of milk in 2007 dairy farmers used 21% of the cows, 23% of the feed, 35% of the water, and 10% of the land that was required to produce the same amount of milk in 1944. And each cow made 4 times more milk in 2007 than 1944. That’s an amazing increase in productivity!” What accounts for the increase? Just as other industries have developed and embraced new knowledge and improved technologies, the dairy industry has improved its breeding practices, created feeding programs that closely match the needs of cattle, and created efficient technology to improve everything from crop production to cow health care to milking parlors. Nonetheless, the dairy industry is one of the most misunderstood agricultural industries of all. After working on dairies in high school and college and graduating from Virginia Tech’s Dairy Science program, offering the public clear answers about dairy farming is near and dear to my heart. Here are some answers to common questions about dairy farming! What is life like for a cow on a typical Virginia dairy? While herds in the state vary in size, many run in a similar manner. Cattle are usually milked twice daily in a parlor using machines. The parlor, machines, and pipelines must be cleaned out judiciously after each milking. Before attaching the milking machines to each cow, workers clean each udder. Cleaning stops contaminants from entering the milk and gives workers the chance to check for any udder problems that might affect milk quality. Cows are only in the parlor for as long as it takes to milk them, usually less than ten minutes. Many farms deliver feed near milking time so that cows can eat back at the barn immediately after they exit the parlor. Many dairies keep their cows in barns with open sides and fans to keep cows cool. The barns have long, open feeding areas, and rows of bedded stalls where cows can lay down. 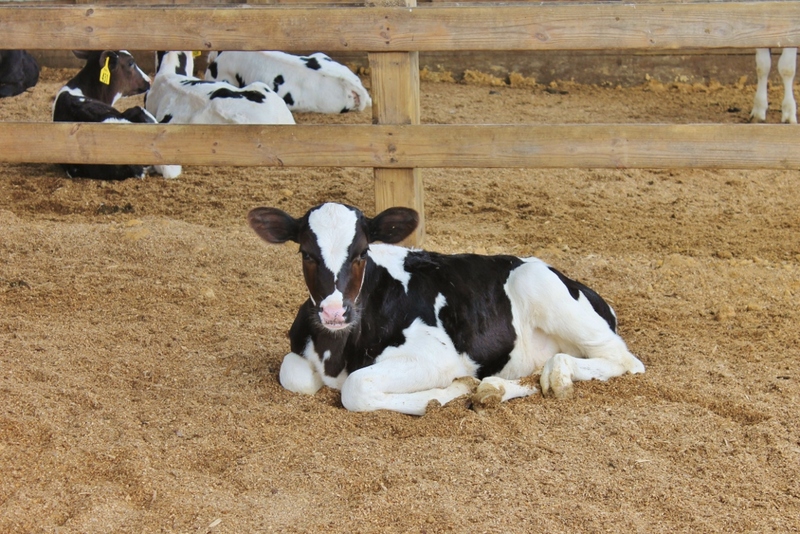 Most farms may use soft sand or shavings for bedding, and some dairies even use a special type of water bed for the stall area. “Cow comfort” in the parlor and in the barn plays a huge role in dairy production and herd longevity, so aside from a shared ethical drive to treat animals properly, there is also a large economic incentive for keeping cows calm in the parlor, well-fed, and content during the daytime with comfortable places to rest. What about grazing? Don’t all cows need grass? Contrary to popular belief, cows living in barns have plenty of room to walk around, get up to eat or drink, lay down, and socialize, but even so, dairies that house their cattle in barns often do have outdoor areas where cattle may be let out for grazing or exercise during certain parts of the day or when grass is available. “Dry” cows and growing heifers often live out on pastures or large lots with plenty of hay for weeks or months at a time. However, maintaining enough pasture to support the milking herd on a grazing regimen alone requires large amounts of land or necessitates a small herd, and due to infrastructure requirements it can be hard to convert a conventional dairy to an all-grazing system. There are a few “grazing dairies” in the state that have been improved or designed to support small milking herds. In these intensive “rotational grazing” systems, cattle move from paddock to paddock each day, allowing time for grass in grazed sections to regrow. Most conventional dairies meet the cow’s need for a forage-based diet with a ration containing a custom-designed mixture of hay, silage, haylage, minerals, high-protein feeds like soybean meal, and grains like corn. Cows are not “pumped” full of grain alone. In fact, cows are fed about 50-60% or more of their total diet in forages like grass, hay, or silage. The remainder comes from grains or byproduct feeds like citrus pulp, beet pulp, rice hulls, and brewers grains that would otherwise go to waste after these raw items are processed for other purposes. Dairies often consult with nutritionists to create economical rations that support rumen health, help a cow express its genetic milk-making potential, and utilize feeds grown on the farm and locally available for purchase. In regards to the dairy industry, there are some extremely large dairies that are family-owned or run by a combination of several families. No matter how the dairy is run, the procedures and principles utilized on a small, family-run conventional dairy are usually not a far cry from the practices of a fairly large conventional dairy—the main difference is size and sometimes technology. For example, some medium and large dairies have switched to robotic milkers that enable the cow to take herself to get milked whenever she feels that her udder is full. Contrary to what many people believe, if you travel outside of Virginia, you will not stumble upon hundreds of corporate mega-dairies. What you will find is that our country is full of thousands of dairies that are run by families—often going back several generations—and while they run the gamut in herd size and production features such as facilities and feeding systems, they share some common traits. Unfortunately, however, many dairies also go out of business each year due already-steep input costs that rise higher by the year and low potential for profit. The trend in the last few years is a decrease in the total number of dairies in the U.S. but an upswing in herd size on dairies that take up the slack. Most people who run dairy farms are not in it to get rich, and some of the changes in the industry that seem foreign to consumers actually represent efforts to improve efficiency or increase the potential for income to support the families that run these operations. Are dairy cows mistreated on farms? A good dairy farmer knows that “cow comfort” affects his or her bottom line. A good dairy farmer—and there are many of them—also knows that it is ethical to treat cows respectfully. Unfortunately, every so often a video of cow or calf mistreatment will emerge on the news. There are bad apples in every industry, and while they are few and far between, they paint a reputation over the whole industry that is hard to shake. These cases are not condoned by the industry, nor are they in any way representative of the whole. The best way to find out how cows are really treated is to ask a farmer about their operation or request a chance to visit, but not all consumers know farmers these days. To fill you in, good farmers walk their animals to the milking parlor quietly, as fear or stress will actually inhibit the cow’s ability to “let down” milk. Although dairy farmers become proficient in treating a variety of calving difficulties and other ailments themselves, they have a working relationship with a vet who is at the farm often to assist with any problems and conduct routine practices like pregnancy checks. Sick cows are given medicine so that they do not suffer needlessly. One scenario that can appear shocking to an outsider is treatment of a “down cow.” As explained by famous blog writer Dairy Carrie on a post titled “Sometimes we are mean to our cows,” a cow living on pasture, in a barn, or in any other management system can lie down and subsequently have trouble getting up due to a hurt leg, pinched nerve, calving complication, or other problems. Due to pressure on organs from the cow’s own weight, getting a cow back on her feet and doing so quickly is the only way to save her. If you observe someone pushing, lifting, or even prodding a “down” animal, what you are seeing could actually represent a last-ditch effort to save the cow. Good farmers are disgusted by true mistreatment. Why are calves separated from their mothers at birth? On most dairies the cow will be given a chance to dry off her calf after birth. Sometimes the calf will nurse to receive colostrum from the cow, and sometimes workers will milk the colostrum from the cow and give it to the calf. Colostrum contains antibodies vital for calf health during the first week of life, so colostrum consumption is imperative for newborn calf. The calf will then be taken to live in an individual hutch with an open front for exercise, a calf barn where each calf has a stall area, or a group-housing area where calves live together in a large pen. The system depends on the farm. Separating the calf from the mother prevents udder damage from the calf nursing, protects the calf from diseases in manure that gets on the udder, keeps calves from being stepped on, and yes, enables the farmer to obtain all the cow’s available milk. Unless a farm owns just a few cows for backyard production, it is virtually impossible for a production dairy to milk and manage cows that have calves with them. So, are the calves distressed? In my personal experience, and according to many others in the industry, I believe they are not. The calf learns very, very quickly that humans are the bearers of milk, so they tend to call after people who approach them but do not bawl after their mothers. Newborns are rather aloof until they develop some leg strength and learn how to drink. Since calves form the foundation of the future herd, on many dairies there is a worker specifically dedicated to calf care. As for the cow, she is more likely to experience some distress than the calf. A few cows will bawl when separated but this may also be due to a change in routine and social group. Most are actually more interested in eating after delivering a calf and are not overly maternal. Maternal instincts are sought after in beef operations where calves live with their mothers, but dairy breeding programs do not have an emphasis these traits. The fact that calves are removed shortly after birth likely prevents some stress that would occur if the pairs were weaned after a few weeks together. Within a day or two, even cows that seem disturbed by the changes post-calving quiet down and show no signs of stress. After calving, cows are given ample space to live and exhibit social behaviors with the rest of the milking herd. I heard that cows are constantly pregnant and are milked year-round. Is this true? On a typical dairy, a cow is “dry” for 60 days before she has her calf each year, meaning that she gets a rest period where she may be turned out on pasture or large lot to enjoy herself and do nothing. Having her calf annually will restart her lactation after the dry period, so she will then re-enter the milking herd. If cows could hypothetically be put back out “in the wild,” they would still have calves annually. Dairy farmers often utilize “AI,” or artificial insemination to breed cows. It enables them to diversify the herd’s genes by allowing a greater choice of herd sires from across the country and it eliminates the dangers associated with keeping bulls. AI is a fast procedure and is practiced by trained technicians and workers. Should I be concerned about antibiotics in milk? Time after time, I come across internet comments and even blogs or articles by folks who insist—or even state as indisputable fact—that milk is full of antibiotics or that cows are constantly “pumped” with antibiotics. This is absolutely incorrect. Antibiotics cost money and time to administer. Therefore, they are reserved for cattle that need them. Some people advocate that antibiotics never be used at all, but in the eyes of many farmers it would actually be quite inhumane to leave sick animals suffering with no treatment. So, if a cow or heifer gets mastitis in her udder, or perhaps if she gets a case of pinkeye after grazing tall grass, she will be treated under the advisement of a vet. Where many people go wrong is the assumption that this treated cow’s milk enters the tank. Antibiotics have a “withdrawal” period on the label that prohibits the animal’s milk from being harvested for a set period of time. The withdrawal periods are based on how long it takes for the milk to be clear of any antibiotic residues. On the farm where I worked in high school and on many others, it is routine to individually test the milk of treated cows that had surpassed the withdrawal period as an extra precaution before they re-entered the milk herd. Dairies may use red leg bands to mark treated cows whose milk cannot enter the tank, or these animals may be kept in a “hospital pen” together. The treated cows’ udders still get full and they must still be milked, but this milk is harvested separately and can then be discarded. Some people believe that farmers constantly bend the rules or pay no attention to withdrawal periods, but in reality, the consequences for having antibiotics in a milk tank are monumental which is reason enough to make caretakers incredibly careful. Shipping milk with antibiotic contamination is illegal. Each and every truckload of milk is tested for trace levels of antibiotics used on dairies, and any batches that are found to contain antibiotics are discarded. The truckload is tested again at the processing plant. Farmers who send in contaminated milk on multiple occasions can lose their production license or permit. Farmers who send in a contaminated tank even once face stiff fines and financial liability for the discarded truckload. The financial penalties for shipping contaminated milk are extreme, as they should be. What about hormones? Contrary to popular belief, there is technically no such thing as hormone-free meat or milk. Animals, just like humans, produce hormones naturally. However, most “hormone-free” milk advertisements intend to say that the cattle were not treated with any additional hormones outside of the ones created by their own bodies. According to the FDA and World Health Organization, more than 90% of any hormones in milk are destroyed by pasteurization and the rest are broken down by the digestive tract. Most of the concern about milk hormones stems from the news about use of BST, a protein hormone that cows already naturally produce on their own. Added BST provided at a certain time in the cow’s lactation increases the volume of milk produced from the cow. Although the FDA has found no difference between milk from BST treated and untreated cows, many farmers have signed affidavits with their cooperatives agreeing to stop using BST in response to consumer preferences. It is estimated that only 15% of farms still use BST. How is dairy farming regulated? The EPA regulates dairy farms under the Clean Water Act. Agencies like the Department of Environmental Quality monitor environmental impacts on the state level. Farms may be required to have a permit. Meanwhile, the Soil and Water Conservation Districts and Natural Resources Conservation Service offer educational support and cost-share opportunities to improve manure management, runoff and erosion issues, and water quality. Much of the regulation is aimed at manure management since dairy cows do produce a lot of manure, but it can be used to provide nutrients for crops, or dairies with anaerobic digesters, can be used to generate electricity. On the food safety side of things, the FDA oversees the enactment of the federal Pasteurized Milk Ordinance, which provides a comprehensive set of requirements for Grade A milk safety during on-farm handling, shipping, and processing. State agencies also play a role in the dairy inspection and regulation. 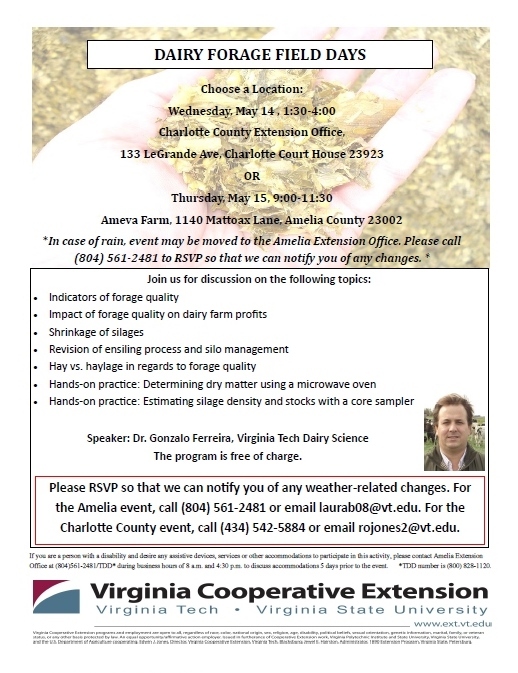 Forage Meeting-May 14th at 1:30-4 at the Charlotte County Extension Office and May 15th, 9-11:30 at Ameva Farm in Amelia. 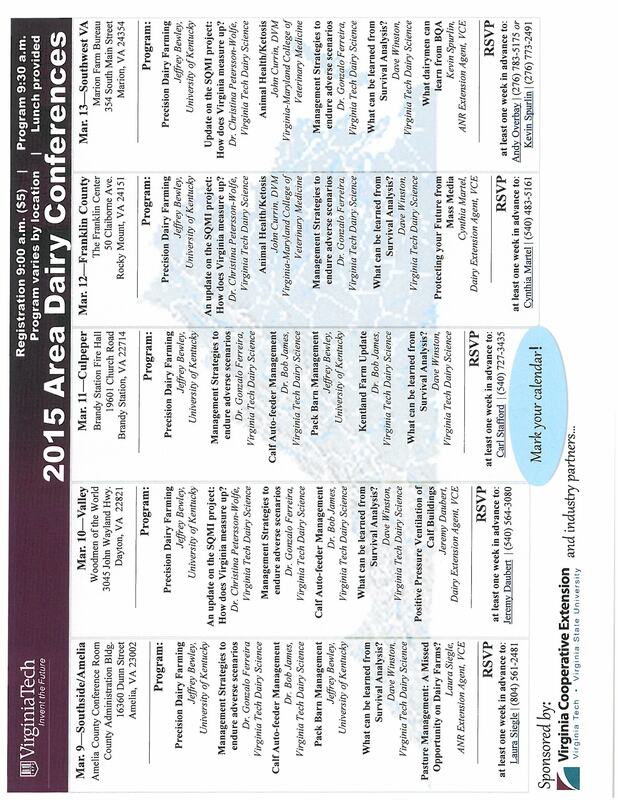 This meeting is primarily geared towards dairy forages but may benefit anyone who works with silage or haylage. If you are interested in EITHER date, please call (804 561 2481) or email (laurab08@vt.edu). Please RSVP in advance so that we can notify you of any changes-in the event of heavy rain, the Amelia event may be moved to the Extension office. Harmon Beckner has 50 milking cows ranging in all lactations he is looking to sell. They are not registered but he has DHI records to go with all of them. Avg milk production is 70 lbs, 4.1% fat, and 3.2% Protein milking 2X. 90 percent of the herd is Holstein with a few Jersey mixes in the bunch. If you know a farmer looking to buy some cows, please have them call Harmon Beckner at 540-420-2517.